It is common thinking that when there is no pain, there are no problems. Why should I go to the dentist and get my teeth cleaned every 6 months when everything seems fine to me. Think about a professional athlete for a moment. An NRL player puts their body on the line in the heavy contact sport. A game is played with a break at half time. At full time there is celebration or disappointment, some discussion and then a cool down with basic exercise. Throughout the week leading up to a game there is regular working out and training. During the off season the body is prepared with more of the same. Advice is heeded from performance experts and past players who have succeeded. Like the body of an NRL player, your mouth and your teeth need to be worked on every day for them to maintain peak condition even if there is nothing wrong. 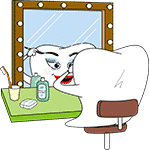 You need to brush and floss your teeth morning and night. You fit in a brush at lunch time when you can. The foods you eat need to be thought out and you are mindful of what you are exposing your mouth to. Experts recommend that you seek professional teeth cleaning services every 6 months to avoid long term issues and keep your teeth in prime condition. You should heed their advice. You look at those around you who are older and have managed to keep their teeth in the best shape. You know those people have taken their dental health seriously. You should be inspired to do the same. Why 6 months you say? Even the most proficient brushers and flosses leave a little bit of plaque and calculus under the gum-line and between the teeth. Leaving that little bit of plaque and calculus there for only a short time is very important. Damage that is caused in the short term may be negligible and easily reversible. For example, your teeth may have lost a little bit of mineral but your saliva has been replenishing it. The gums may become a little redder, swollen and sometimes bleed. This is what is commonly called early gum disease or gingivitis. Getting your teeth cleaned in a timely manner can help the gums return to a pinker and firmer state with reduced or no bleeding. Choosing to delay your teeth cleaning is when the problems begin. Plaque and calculus will continue to build up. Your mouth will be under constant attack from bacteria which can cause your teeth to break down faster than your saliva can replace the lost mineral. You may have cavities form in your teeth and develop tooth decay. Your gums will continue to break down and allow bacteria to attack the bone. This will lead to advanced gum disease or periodontitis. Unlike gingivitis, periodontitis is irreversible. Once you lose gum and bone it is gone and will not grow back. It is essential to preserve what you currently have. Let's Talk About Keeping Things Clean! We'll Make Sure You Can Finish The Match! Just because you can’t feel the symptoms doesn’t mean you don’t have the problem. Many symptoms of tooth decay and gum disease will only present when the case is already severe. So most of the time you will not realise you even have a problem until it is too late. Don’t wait until you have symptoms before you come in to see us. By then it may not be a case of a quick clean. You may need more work like fillings. It could be more complex and require root canal treatment or crowns to save the teeth. Teeth cleaning should be thought of as a preventative step not a solution to your dental issues. A regular clean is not an expensive process. It isn’t painful unless you have developed some severe damage. Conversely, if you avoid it then looking after your teeth will become both painful and expensive. That pain won’t be limited to when you get things fixed up. It will affect every part of your daily life. You may not be able to enjoy the same food and drinks. You may find other aspects of your life are not as enjoyable. Even your confidence and interactions can be affected by dental problems. Come in and see us regularly and we’ll keep the good times rolling for your teeth. Many patients are worried about teeth cleaning at the dentist. Some patients are worried about the teeth cleaning cost. They want to know what the dentist teeth cleaning cost is in the Brisbane city. Some patients are worried about the teeth cleaning tools. They want to know what’s in our teeth cleaning kit. They are worried about teeth cleaning side effects. They often ask, “does teeth cleaning hurt?”. Other patients ask, “is teeth cleaning necessary?”. They say, “I do teeth cleaning at home. Why do I need to go to the dentist for it?”. Other patients want to know about teeth cleaning and whitening. They want to know if teeth cleaning whitens their teeth. They ask to see teeth whitening before and after photos which show a significant change in teeth colour and appearance. The answers to these questions are positive and a relief to most patients. Teeth cleaning cost in the Brisbane city at our dental clinic is very reasonable. We offer new patients a dental checkup, 2 digital x-rays to check in between their back teeth, ultrasonic teeth cleaning, polishing and preventive fluoride treatment for only $190 (normally $295), or health fund rebate only (no out-of-pocket gap payment) if you have health insurance with dental cover*. We are preferred providers for many health funds, including CBHS, HCF, nib, Australian Unity, Defence Health, Peoplecare, health.com.au, Budget Direct, Frank and GMHBA, so you can receive a dental checkup and clean every 6 months for no gap payment or a small gap payment*. We don’t use the sharp scaling instruments that were traditionally used and caused fear in some patients. It can now be done in a more gentle fashion and does not have to be painful. We do teeth cleaning with a special ultrasonic scaler which is not sharp and uses ultrasonic vibrations to remove plaque and calculus without hurting or damaging the teeth and gums. Teeth cleaning at the dentist is necessary as even the best teeth cleaning at home leaves a little plaque and calculus behind which can damage the teeth and gums over time. It is recommended to see a dentist for a checkup and clean every 6 months to avoid this. Teeth cleaning and polishing at the dentist will also remove superficial stains from the teeth surfaces and will provide some teeth whitening effect. However, professional teeth whitening with take-home trays or in-chair with the dentist may still be needed for better whitening results. Preventive fluoride treatment after the teeth cleaning and polishing helps repair and strengthen the cleaned teeth surfaces.